This past weekend I spent a few nights at my brother’s apartment. He’s in London, being adventurous. I decided to hang out at his place for a couple of days and swim in his pool. Unfortunately, the first day we were there the weather was oddly chilly and overcast so I ended up folding the laundry he’d left in is dryer while Elle and her friend played Red Dead Redemption repeatedly on Xbox. The second day was full of sunshine and nearly perfect, right down to discovering the nearest Starbucks is just around the corner from his place. I pretty much filled my time by watching endless episodes of The United States of Tara on Netflix, trying to get his lights and ceiling fans in sync with one another, and listening to the elephant that lives upstairs move furniture around at 2AM. Actually, that neighbor isn’t really an elephant; she’s a single woman with a chihuahua. And it’s only a one-bedroom apartment so…really, how much furniture could there possibly be? There are some really nice neighbors that live next door to him, though, who were willing to hand over their corkscrew to me, a complete stranger. First, they invited me in and I met their overly crotch-friendly German shepherd. There was a tiny dog, too, but I hate tiny dogs so I didn’t pay him any attention. Jack is the exception to my hatred toward tiny dogs, but I still don’t trust him completely. Anyway, it was our last weekend in Jacksonville for a month or so. Saturday we all leave for Oklahoma City. I’m gearing up for a week full of serious tasks – cleaning, organizing, packing, and a last minute dental appointment. At some point this week, I will partake in beach therapy. And as soon as I get to OKC, I will have to find my way to Arcadia Lake, the only lake in the metro area I’m aware of that allows swimming and has what is called “a beach”. 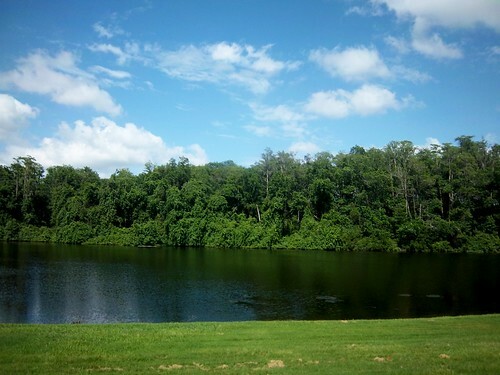 It’ll be nice to stand in a quiet body of water and not worry about getting chased by alligators or bumped into by sharks, all of which have happened to me since moving to Florida. When it comes to lakes in this state, they are full of critters, including venomous snakes, so it’s usually best to just sit back and enjoy the view – which is something else I did at Nick’s apartment. I'm a New Hampshirite by way of suburban Cleveland, by way of Oklahoma City, by way of North Florida, by way of Southern Maryland, by way of Upper Michigan, by way of Northern Italy, by way of Lower Michigan, by way of Texas. Because of living in so many places, I have something in common with almost everyone I meet. I love reading, writing, and American history (especially reading or writing about American history). I'm interested in culture of home and place, historical trauma, and writing about the kinds of histories most people don't know about. This entry was posted in adventuring, Florida, home, Jacksonville, life, neighbors, Oklahoma, Oklahoma City, outdoors, the beach, travel and tagged Arcadia Lake, Florida, Jacksonville, life in Florida, nature, OKC metro, Oklahoma, Oklahoma City, outdoorsy stuff. Bookmark the permalink.